Sharp Form Carrier Tape, or SFT™ was developed specifically for small form factor devices having precision packaging and confinement requirements. Razor sharp radii and near-vertical side-wall draft angles keep devices level and stable in the pocket, helping to prevent abrasion and reducing pick faults. Small form factor devices served by SFT™ include bare die, flip chips, CSP's, BGA's and bumped die. Carrier Tape with a complex design has the same performance features as tapes with basic designs, but contain pocket features such as chisels, pedestals, tapers, corner reliefs, raised bridges and more. These design elements ensure your devices are contained and presented precisely and securely in form fitted pockets. Basic Carrier Tape is provided splice-free in single and level wind reel configurations. The number of meters of carrier tape that will fit on a given reel is conditional upon the pocket pitch, pocket depth, and reel configuration. Carrier tape is manufactured in accordance with EIA and EIAJ standards in a range of widths from 8mm to 200mm, and lengths up to 1000 meters, depending on the size and orientation of the device being packaged. 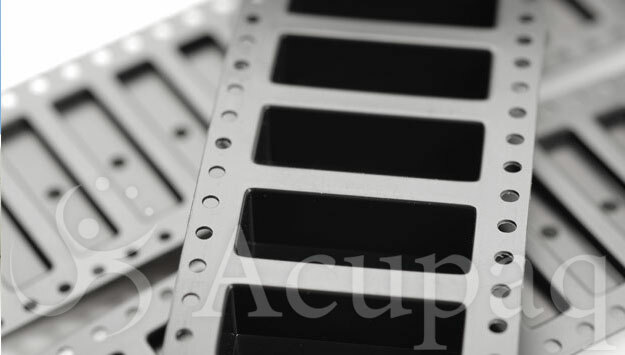 Multiple manufacturing processes and a wide variety of materials are available to ensure your requirements are met. The standard reel configuration is single-wind carrier tape on a 22" diameter corrugated paper reel. Single-wind reel flange diameters are available include 13.0", 22.0" (standard) and 30.0". Level-wind reel flange diameters include 14.25" and 22.0". Both corrugated paper and corrugated plastic reel flanges are offered. Protective Interleaf Tape™ is designed to separate sensitive components such as flex circuits of products manufactured in a continuous strip. Packaged components make minimal contact with the tape, making it ideal for storage and shipment of small, thin and lightweight components. Vacuum-packaged to prevent development of particulates from abrasion or vibration Protective Interleaf Tape™ is manufactured from 0.20mm or 0.25mm homogeneous polystyrene, polycarbonate film in widths up to 200mm. It is available in a variety of materials, including static dissipative and insulative. Our Protective Interleaf Tape™ is shipped in reels or reel-less configurations. Camber All carrier tape meets the EIA-481-D standard for camber that is not greater than 1mm in 250 linear milimeters. For 8mm to 24mm carrier tape in the level wind format, the camber will not be greater than 2mm in 250 linear millimeters.